On the afternoon of September 20, 1863, the 18th Ohio charged up the back slope of Hill One on Horseshoe Ridge, Captain Pearly Brown, this sword in hand, led company A up that hill. 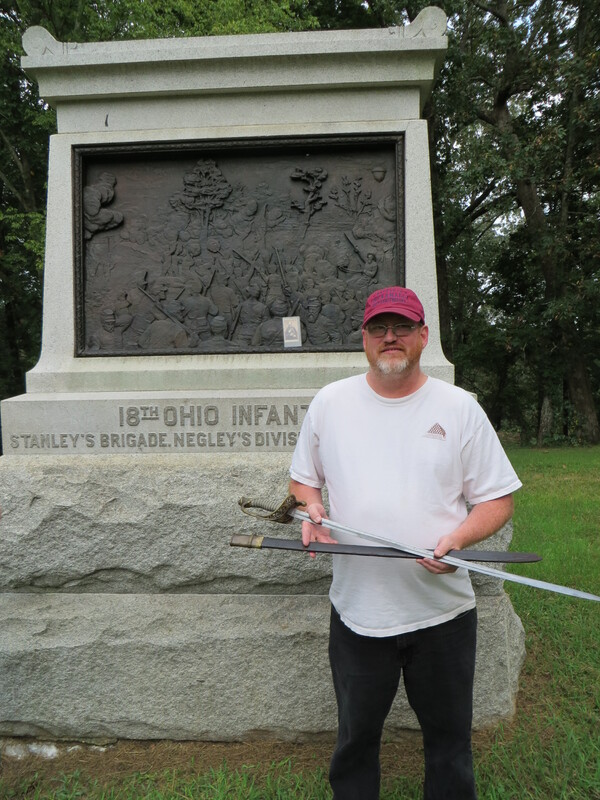 Over the 150th, I got a chance to meet some descendents of the 18th Ohio, who were doing their own program, and had to get a picture of myself with Captain Brown’s sword. Here is a link to the 18th’s Webpage, where you can see more info on the regiment, and on Captain Brown. This entry was posted on September 25, 2013 at 8:34 am and is filed under Uncategorized. You can follow any responses to this entry through the RSS 2.0 feed. You can leave a response, or trackback from your own site. It seems you forgot the link to their webpage. Thanks, Perry, I tend to do that. :) fixed. You spent a week down here and that’s all you’ve got? Of course, you have to work sometime. . .
Time is ever the enemy, Sam. I’ve picked up a few images here and there. Yes, please do a post on what the crowds were like at the battlefield, how did the tours go, and what the unveiling of the Lytle monument was like etc. As a descendent of Hilliard’s Legion, and thus Gracie’s Brigade, I would have enjoyed meeting others with family links to the fighting on Horseshoe Ridge. I look forward to reading your full description of the event. I know you were working, but your blog helps those of us who could not be there and I thank you for that.